MCALLEN, Texas — Illegal aliens rioting in a private prison near the Texas border have left the prison in uninhabitable conditions, forcing federal authorities to move inmates to other facilities. 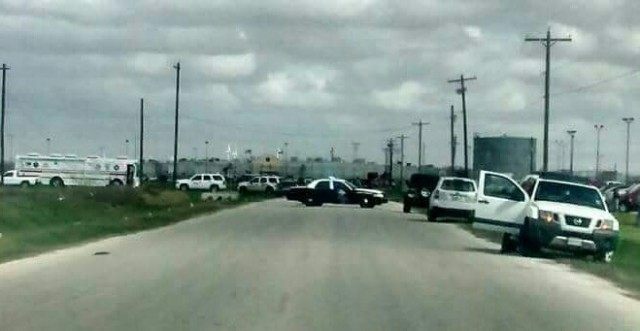 The riot broke out earlier this week when 2,000 prisoners at the MTC private prison in Raymondville refused to go have breakfast and subsequently refused their work detail. As Breitbart Texas previously reported, the inmates then broke out into the outside areas of the prison and began ripping up tents and setting fires around the facilities. The rioting resulted in two guards and three inmates being injured. Federal officials confirmed to Breitbart Texas that their injuries were not serious. The U.S. Bureau of Prisons also confirmed that the injuries to guards and inmates were not significant. Several state, local, and federal agencies were dispatched to the location to help set up perimeter security while they worked to bring the riot to a peaceful resolution, according to a prepared statement from the FBI to Breitbart Texas. The FBI took over command of the situation since the prison is under federal contract with the government to house federal detainees. In the aftermath of the riot, the U.S. Bureau of Prisons (BOP) was notified by MTC that the prison is in an uninhabitable condition due to the damage caused by the inmates, a prepared statement from the BOP revealed. MTC also asked for their help in moving the inmates to other facilities. For most of the coming week, MTC and the BOP will be moving all of the 2,800 inmates out of the damaged facility, the BOP statement revealed. Since last year, a shift in immigration routes led to hundreds of thousands of illegal aliens coming through South Texas, rapidly creating a problem for federal authorities and courts, who have had to focus primarily on illegal entry cases that have overwhelmed their detention facilities. However, as Breitbart Texas previously reported, rather than being a quest for the American Dream, Mexican drug cartels have turned it into a nightmare.